Scranton is home to much beauty and talent. That's why I like Scranton. 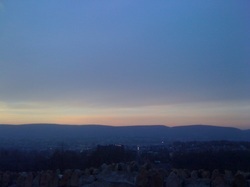 And why I choose to call Scranton my home. This site will show you the many reasons why ... I like Scranton. Hopefully, you'll see for yourself and like Scranton too! Scranton is known for being the first city to use an electric street car system, thus giving it the name of The Electric City. Scranton also has the history of being home to many coal mines and more importantly, home to many hard-working families who started a long tradition of a strong & proud work ethic. We can only ever live in one place - preferably the now - but we do honor our past and imagine the many possibilities to build a great future, together.